Jordan's King Abdullah II may be facing the most serious challenge to his 13-year reign, with this week's protests rocking every corner of the country with some of the worst-ever violence after the government announced the removal of fuel subsidies. Analysts say the opposition Muslim Brotherhood and its political wing, the Islamic Action Front, may be stoking the flames of dissent in a bid to raise its own profile ahead of the parliamentary elections on 23 January, which it has vowed to boycott. Jordanian political commentator Osama al-Sharif says the magnitude of protest violence represents an "important threshold for the regime, the opposition, the government and for the stability of the country". Mr Sharif says the current crisis has been "compounded by political deadlock over the elections... and the terrible economic situation, described as extremely dangerous and unprecedented". Clashes raging in towns and cities nationwide late on Wednesday - the second straight day of protests against the subsidy cuts - witnessed the death of a youth activist, Qais Omari. His family disputes police accounts that he was a "gunman" who had attacked a police station in the northern city of Irbid. Thirteen policemen were also among 17 wounded in various incidents, which saw riot police use water cannon, tear gas and rubber bullets in an effort to disperse protesters, who responded sometimes in kind with gunfire. Demonstrators also set fire to government buildings and blockaded major roads. In other cases, riot police dispersed peaceful protesters after they publicly criticised the king - a penalty punishable by up to three years in prison - with some calling for his overthrow. "It is a serious challenge - probably the most crucial since Abdullah became king, especially in light of some of the slogans that have been raised," Mr Sharif says. "Freedom is from God, in spite of you, Abdullah," has become a rallying cry among the demonstrators. The subsidy cuts announced by Prime Minister Abdullah Ensour - which saw the price of gas used mostly by low-income families for heating and cooking rise by 54% - angered a public already suffering from high unemployment, poverty and inflation. As the fifth prime minister appointed by the king since the outbreak of protests in Jordan nearly two years ago following the start of the Arab Spring, Mr Ensour said the measures were needed to reduce a massive budget deficit of $5bn (£3.1bn). Disruptions to cheap Egyptian gas shipments - the result of attacks on pipelines in the Sinai desert - have cost Jordan an extra $7m (£4.4m) a day, he said. Foreign grants to the aid-dependent kingdom have also plummeted. The government was nevertheless reportedly reluctant to cut subsidies, mindful of the widespread unrest that swept the depressed south after price hikes in 1989 and 1996. "It's a 'catch-22' for the government," Mr Sharif says. "Any decision to raise prices on essential goods, such as cooking gas and cheap gasoline are not popular, especially at the beginning of winter when Jordan is going through a very bad recession with higher rates of unemployment, poverty, and so many challenges on the political front." "This tells you that their hands are tied." While acting Information Minister Nayef al-Fayez says the government has been trying to "prep" the public for some time that subsidy cuts were needed and that "some compensation would be made to help low-income families", critics say the additional funds will not stretch far enough. King Abdullah has so far managed to weather the political turbulence of the Arab Spring uprisings, that saw long-time rulers toppled in Egypt, Tunisia, Yemen and Libya, by instituting some political reforms such as giving parliament the right to appoint the prime minister after January's polls. Some observers say the elections, meant to be a centre-piece of the king's reforms, have been undermined by the Muslim Brotherhood's refusal to participate. Brotherhood leader Zaki Bani Irsheid predicts that ordinary Jordanians will explode into the streets over the subsidy cuts, calling the recent protests a "a wake-up call to the king". Government security officials believe some Islamists are "exploiting" the issue and even inciting widespread anti-government unrest. "It looks like the Islamist groups may be willing to take the issue far and this is very dangerous," Mr Sharif says. "They are putting their own agenda ahead of the stability of the country. They must realise that they are playing with fire and, once there is total chaos, it is very difficult to bring things under control." However, Julien Barnes-Dacey of the European Council on Foreign Relations does not believe there is an immediate prospect of sweeping unrest engulfing Jordan or its ruler. "The protests we are witnessing at the moment could disappear in the coming days," he says. "But they point to a deeper malaise of ongoing of political and economic concerns that really risk provoking wider turmoil, if not addressed." 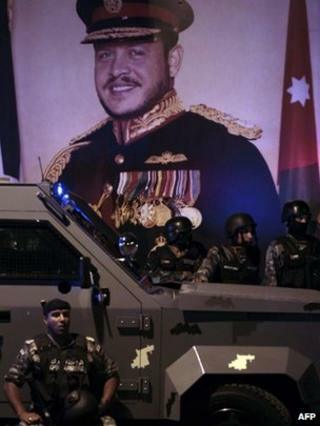 Pete Moore, writing in the journal of the Middle East Research and Information Project (MERIP), expresses surprise that Jordan and its king have so far escaped the Arab Spring tumult, saying the political and economic ingredients which triggered uprisings in other countries are also present in the kingdom. But Mr Moore adds there are also some important differences. For one, he says, the US wants to "preserve the status quo" in Jordan, a key regional ally, because it considers the kingdom a "'safe zone' in a sea of unrest". On Thursday, State Department spokesman Mark Toner called on protesters to express their discontent peacefully. "We support King Abdullah II's roadmap for reform and the aspirations of the Jordanian people to foster a more inclusive political process that will promote security, stability as well as economic development," he added. Still, Mr Sharif says a peaceful resolution with some give and take from both sides is needed to end the current crisis. "When we see what is happening around us and what is taking place in Syria, I don't think that any Jordanian would want to see Jordan being driven into the precipice," he adds.